Nurse or nursing student? Please sign the letter against any RCN move to support the introduction of abortion on demand, for any reason. Janet Davies, the Chief Executive of the Royal College of Nurses (RCN), has announced that a panel of RCN staff and members will be deciding on a positioning statement for the RCN on the complete removal of all legal restriction and sanctions regarding abortion. If these measures were to be implemented, it would mean the introduction of abortion on demand, for any reason, to at least 28 weeks and possibly up to birth. Ann Furedi, the CEO of abortion provider BPAS, who are running the campaign to ‘decriminalise’ abortion, has made it clear that they are aiming for the latter, the introduction of abortion up to birth. The Royal College of Midwives’ position in support of ‘decriminalisation’, which saw a large public backlash when it was adopted, has subsequently been used extensively by abortion provider BPAS as a key plank in their political lobbying for the introduction of abortion, on demand, for any reason up to birth. Ahead of this panel deciding the position, the RCN are running a ‘survey’ of the RCN membership which does not allow for members of the RCN to vote on the specific wording of the final positioning statement. It instead asks a single question on whether members support or oppose the broad concept of ‘decriminalisation’ and only commits that members’ input will ‘inform’ the work that will lead to the final position this panel will decide on. If you are a nurse or nursing student, please take action by putting your name to the public joint letter (link below) to the Chief Executive of the Royal College of Nurses, Janet Davies, to voice your concern about this extreme move. 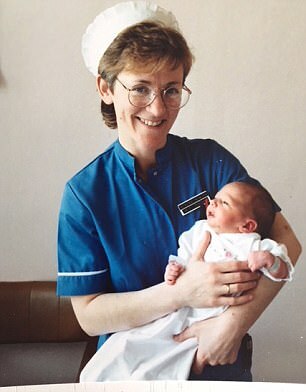 Scottish midwife, great friend of ours and all round remarkable person, Mary Doogan, tells the Mail why she is supporting a much-needed change in the law regarding conscience. She was forced out of her job as a senior midwife after refusing to supervise abortions. You can visit www.freeconscience.org.uk to find out more about the Conscientious Objection (Medical Activities) Bill and please consider making contact with your MP asking them to support the Bill. 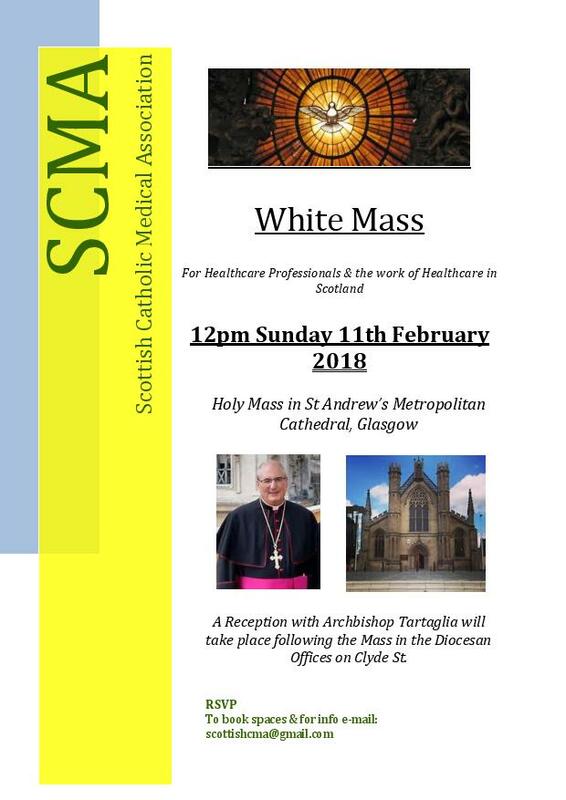 Just a reminder that this year’s White Mass, for Healthcare, is next Sunday 11th February at 12 noon in St Andrew’s Cathedral, Glasgow. Further details on poster below. Please come if you are a healthcare student or professional eg. doctor / nurse / healthcare assistant / pharmacist / carer / physiotherapist etc. and invite your friends to come too. For Healthcare Professionals and the work of Healthcare in Scotland. All those in healthcare are invited to please make a special effort to attend this annual Mass. 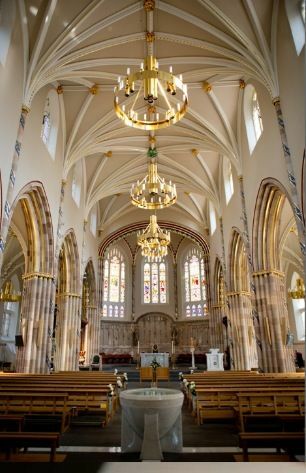 Mass will be followed by a reception with Archbishop Tartaglia, including buffet lunch. Just a reminder that you are invited to a brainstorming session on fertility, on Tuesday 23rd January at 7 pm, at the Cardinal Winning Pro-Life Initiative. If you are able to attend, please let us know by email to gospeloflifesisters@googlemail.com Also please pass on invitation to anyone else who may be interested. 50 years on from Humanae Vitae, we are all aware of the widespread scepticism and disregard of the Church’s teaching on family planning and artificial reproductive technology. There is need for a renewed effort to counter this scepticism and replace it with the joyful message of the gift of fertility. We want to bring together the various groups and individuals interested in promoting the Church’s teaching on fertility, with the aim of co-ordinating our efforts to effectively promote an appreciation of fertility, counter the contraceptive mentality of society and promote a Catholic approach to infertility. We want to hear about what you are already doing and what ideas you have for the future. Aware that the issues involved may take some preparation, if you have any resources you think it would be useful for other participants to know of in advance, please email back with a link to more information. These resources will be compiled into one email and sent out to participants in advance of the meeting.